The 1 - 1 full time scoreline means a point well earned for City and a point that edges them closer to West Ham who were hammered 5 - 1 at Ipswich. This coming Saturday West Ham entertain Millwall in what should be a home banker. If they manage to lose that game Cardiff could go top if they beat Blackpool. Southampton are away at in form Birmingham in the 5:20pm kick off. Southampton missed out on the chance to move top of the npower Championship table as they came from behind to claim a draw at home to third-placed Cardiff. 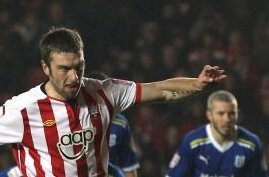 Craig Conway opened the scoring when he made the most of a poor punch from goalkeeper Kelvin Davis to fire home, but Rickie Lambert, Southampton's main threat throughout, scored from the spot after Kevin McNaughton was harshly deemed to have handled an Adam Lallana cross. The point moved Saints two points behind leaders West Ham, who were heavily beaten at Ipswich, while Cardiff are now three points behind Sam Allardyce's side. Southampton made six changes from the side held to a 1-1 FA Cup draw by Millwall, with Lallana and Jose Fonte back from injury. McNaughton returned to the Cardiff defence and David Marshall replaced Carling Cup penalty hero Tom Heaton in goal. The home side started brightly, with Lambert attempting a 30-yard shot which dropped inches wide. The same player then sent a header over the crossbar after good work from Lallana down the left. Southampton thought they should have had a penalty when Lambert was pulled to the ground in the area, but referee Mark Haywood waved away appeals. It was a one-man show as Lambert spurned another chance in the 32nd minute, heading over a corner from Dan Fox. They were made to pay for their profligacy as Cardiff snatched the lead from their first chance. Davis struggled to punch clear from a Peter Whittingham corner and the ball fell to Conway who rifled the ball into an unguarded net. Andrew Taylor's long-range strike was punched away by Davis, while Lallana blazed wide twice in quick succession at the other end before the break. Nigel Adkins' side started the second half with purpose, and after Lallana had another strong penalty appeal turned down, Saints were finally awarded a spot-kick when a Lallana cross was adjudged to have been handled by McNaughton. Lambert stepped up and made no mistake, slamming the ball past Marshall for his 19th goal of the season. Southampton were pushing hard for a winner but were almost caught when Bluebirds striker Kenny Miller fired over from 12 yards. Aron Gunnarsson was wayward with a left-footed drive from just inside the area while the busy Lallana saw a close-range effort scrambled away by Marshall as the game ended all square. Southampton Davis, Richardson, Martin, Fonte, Fox, Puncheon (Lee 61), Schneiderlin, Cork, Lallana, Connolly (Hammond 87), Lambert. Subs Not Used: Bialkowski, Harding, Falque. Cardiff Marshall, McNaughton, Gerrard, Turner, Taylor, Cowie, Whittingham, Gunnarsson, McPhail (Kiss 78), Conway (Gestede 62), Miller. Subs Not Used: Heaton, Mason, Blake.